With the number of kidney transplants likely to reach a new record this year, the National Renal Transplantation team at Beaumont Hospital has produced new guides to inform the public on what these transplants involve. The information is contained in two videos and supporting booklets. Kidney Transplantation - A Guide for Patients explains exactly what is involved from a patient's perspective and the benefits and risks associated with kidney transplantation. Thinking About Donating a Kidney? provides information for potential living donors on the various procedures involved in donation, the benefits and the associated risks. The new guides are timely, says Beaumont's Clinical Director of Nephrology, Urology & Transplantation, Professor Peter Conlon, because of the sharp increase in renal transplant activity this year. In the first six months of this year 111 kidney transplants were completed. This compares with 121 for the whole of last year. The increased level of activity suggests that the full year outturn for 2011 could well exceed the previous record of 172 kidney transplants in 2009. Professor Conlon says there appear to be three main reasons for this year's performance. "The living related donor programme is gaining momentum. Two more renal transplant surgeons have recently been trained in laproscopic, or keyhole, techniques and up to 70 potential donors are likely to be evaluated under the LRD programme this year. It is likely Beaumont will complete in the order of 30 living donor transplants this year, which would be a significant increase on last year's figure of 23." The other significant factors, Professor Conlon said, were a growing understanding by the public of the enormous benefits of donation and increased participation by acute hospitals throughout Ireland in the process of helping to identify and support potential donor families on the deaths of their loved ones. Commenting on progress so far this year Professor Jim Egan, Clinical Lead at the new National Office for Organ Donation and Transplantation, noted that the number of deceased donations reported by the National Organ Procurement Service at Beaumont had increased significantly, with 50 in the first six months this year compared to 58 in the whole of last year. "This has a significant positive effect on all types of transplant - heart, lung and liver as well as kidney and pancreas," he said. "I am optimistic that the new National Transplant Office will provide the sort of focus needed to maintain the improvements we are currently seeing." The new informational videos and booklets can be viewed on the internet at www.beaumont.ie/kidneyinfo.ie and the videos are also available on CD. CDs and the associated booklets can be obtained from the Nephrology & Renal Transplant Medicine Department at Beaumont Hospital and from the Irish Kidney Association, which has financially supported their production. 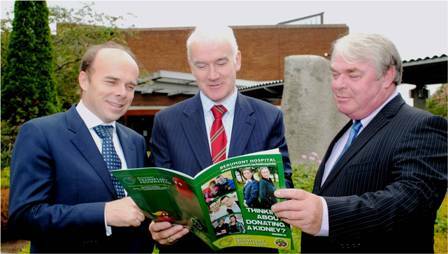 Our photo shows (from left) Professor Peter Conlon, Clinical Director of Nephrology, Urology & Transplantation at Beaumont Hospital, Professor Jim Egan, Clinical Lead, National Office for Organ Donation and Transplantation and Mark Murphy, Chief Executive, Irish Kidney Association, reviewing one of the new kidney transplant booklets.